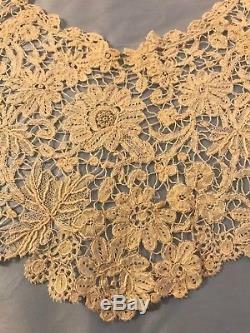 Recently brought from Bruges to the United States, exquisite Belgian Lace Collar Piece, probably late 19th Century. 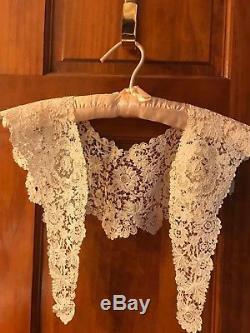 Handmade with super fine linen thread; extraordinary detail! 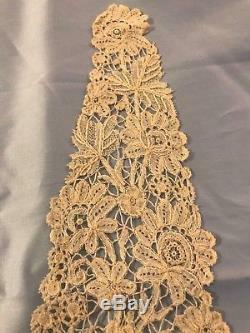 A masterpiece of lace history. 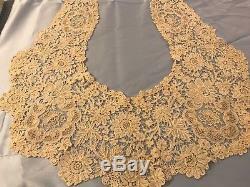 The collar piece WHEN LYING FLAT measures 22" long, 20" across, 5" wide at its widest and 2" at its least widest. 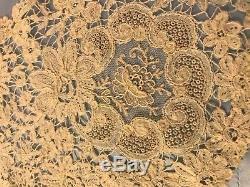 It is a rich buttery linen with superb detail. Overall, it is 40 in Length. 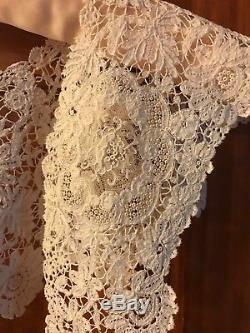 There is one minor structural flaw (see the photo of the lace along the back neck area - it is microscopic); this Collar Piece APPEARS TO HAVE NEVER BEEN USED. 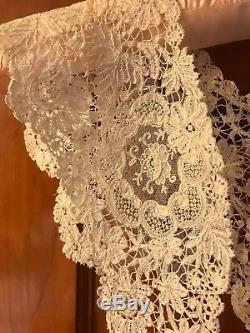 Long live the love of antique handmade lace! 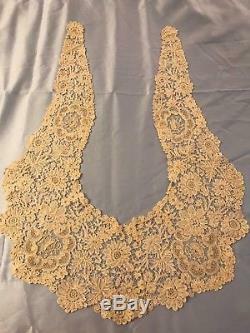 The item "EXQUISITE 19TH CENTURY BRUSSELS LACE COLLAR PIECE POINTE DE ROSE" is in sale since Sunday, October 7, 2018. 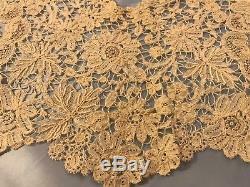 This item is in the category "Antiques\Linens & Textiles (Pre-1930)\Lace, Crochet & Doilies\Collars & Cuffs". 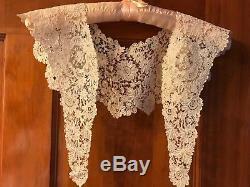 The seller is "iloveelliot" and is located in Northville, Michigan. This item can be shipped to United States, Canada, United Kingdom, Denmark, Romania, Slovakia, Bulgaria, Czech republic, Finland, Hungary, Latvia, Lithuania, Malta, Estonia, Australia, Greece, Portugal, Cyprus, Slovenia, Japan, Sweden, South Korea, Indonesia, Taiwan, South africa, Belgium, France, Hong Kong, Ireland, Netherlands, Poland, Spain, Italy, Germany, Austria, Israel, Mexico, New Zealand, Singapore, Norway, Saudi arabia, Ukraine, United arab emirates, Qatar, Kuwait, Bahrain, Croatia, Malaysia, Chile, Colombia, Costa rica, Dominican republic, Panama, Trinidad and tobago, Guatemala, El salvador, Honduras, Jamaica.